Here is another great resource from Dr. Jackie Gerstein, one of our favourite EdTech bloggers. 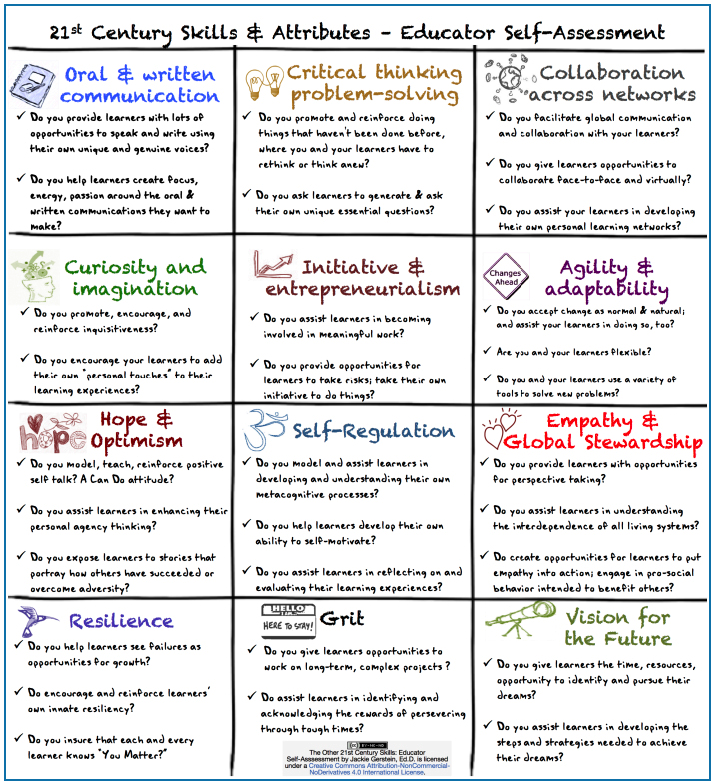 Jackie designed this beautiful chart featuring 12 attributes and skills that teachers should tend to in their instruction. You can use it as a self-assessment checklist to help you evaluate your teaching practice. What I like the most about this chart is the fact that it emphasizes the social and affective component in learning, something which is often overlooked in today’s digitally-focused learning paradigms. These mechanical skill-based and market-oriented paradigms reduce students to ‘cheerful robots’ and view pedagogy as ‘merely a skill, technique, or disinterested method’ to teach pre specified subject matter' (Giroux, 2011). Instead, education should be viewed as an important locomotive not only for gainful employment but also for ‘creating the formative culture of beliefs, practices, and social relations that enable individuals to wield power, learn how to govern, and nurture a democratic society that takes equality, justice, shared values, and freedom seriously. (Kindle Location, 67 from "On Critical Pedagogy"). Check out Jackie's original post to access more resources and links accompanied with this chart.